Jyrgalan back country skiing yurt lodge: 50+ cm of fresh powder. Aksuu back country skiing yurt lodge: 35-45 cm of fresh powder overnight. Karakol ski resort: around 20 cm of fresh powder. There was also a couple small snowfalls during the past 7 days. The weather is already a spring-like and more and more slopes are becoming avalanche-dangerous. There was an avalanche fatality at Karakol ski resort a few days ago. A family of 2 adults and 9 y.o. kid went off-piste and triggered avalanche. Whole group got caught by avalanche and while 2 adults ended on the surface the kid got buried. Not much information available but seems like no any avalanche beacons or safety gear were used. The kid didn’t make it. As said in the previous post – this winter is quite poor for snow in the Northern Kyrgyzstan. At this date (Jan 18, 2018) we have around 40-45cm of snow at the Aksuu Backcountry Skiing yurt lodge site and around 50-60cm at the higher-altitude slopes. See some photos below. Aksuu back country skiing and splitboarding yurt lodge is ready to welcome guests for 2017 winter season. 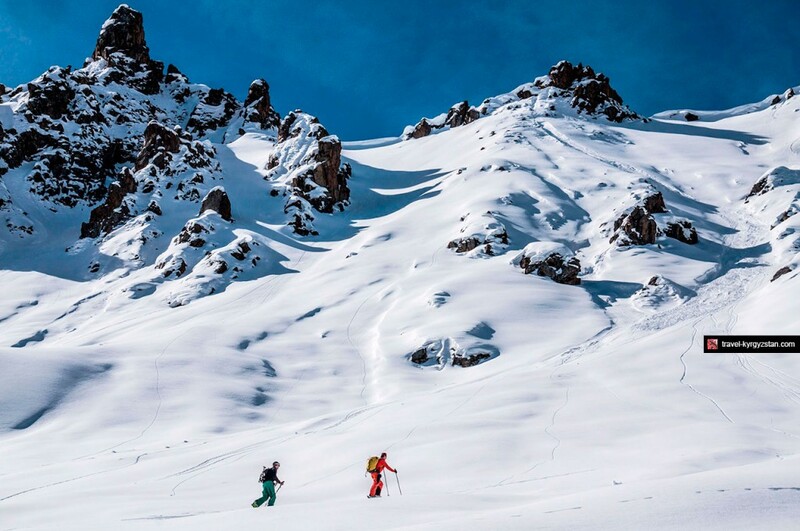 A great number of different skill-level ski touring areas available at the ski-out zone just around the Yurt Lodge. 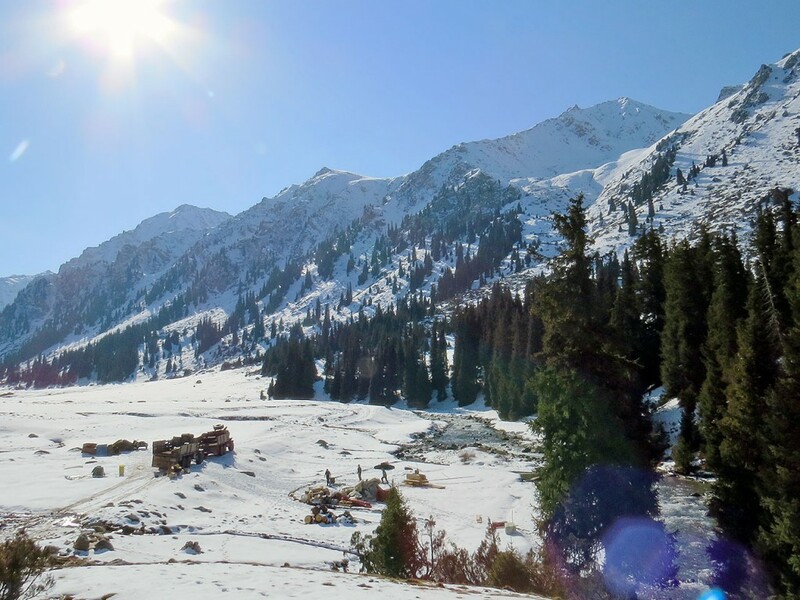 We are located just 8km from Karakol, Kyrgyzstan and ready to transfer your group from Aksuu (Teploklychenka) village to our cozy lodge with snowmobiles. After one week at the Aksuu backcountry skiing yurt lodge we have done a lot of small upgrades all over the camp. We have a slackline and swing now. New sauna looks and feels so great. We already had a couple snow dumps since beginning of November. We had a very special guests on March 2015. Travelers With Skis team came to visit Aksuu Backcountry Skiing Yurt Lodge, try out our camp life and shred the slopes all around. Check out the 15 min long video which will motivate you to make a step our of this world for a while and find the feeling of real freedom. Aksuu Backcountry Yurt Lodge is ready for 2015/2016 season! This season we started earlier to avoid difficulties connected with the transportation of all camp stuff and yurts. The way up to the Aksuu Backcountry Yurt Lodge site took just 3 hours with 2 military soviet URAL trucks compared to 3 days last years late December. We are already running, welcome. 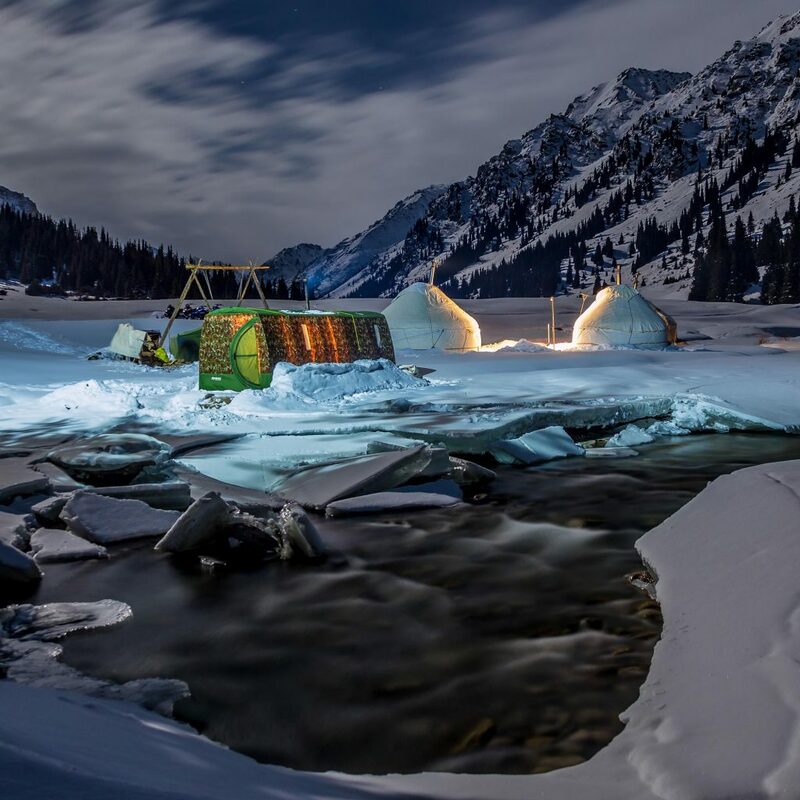 Continue reading Aksuu Backcountry Yurt Lodge is ready for 2015/2016 season! More then a year of shooting in different locations. Gone through all weather conditions, meeting different people all around the country. And finally 6+ weeks of editing. Result is this nice shot movie. Check out some Aksuu Backcounty Yurt Lodge scenes through the video. See fullscreen 1080p and headphones. We have updates on our program page. We are setting up 3 brand new yurts and a new sauna for the upcoming season. The prices remain the same and the most affordable around the Kyrgyzstan’s BC camps! Check it out Aksuu Yurt Ski Lodge. Plus some new photos on our gallery.